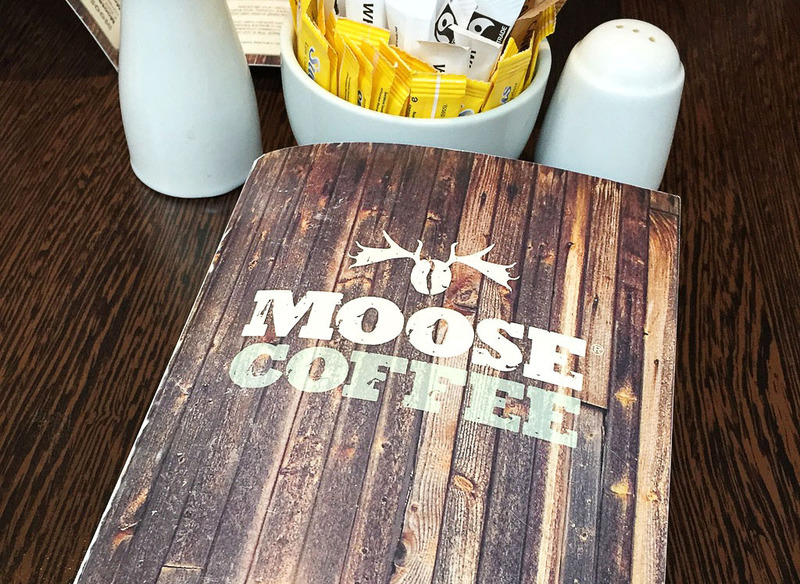 If you're ever feeling a bit peckish and happen to be in Liverpool or Manchester, head straight for Moose Coffee! I discovered Moose Coffee through Inthefrow's 'The 12 Best Places to Eat in Manchester' and I'm ecstatic that I did! Their american style menu is so incredible, it makes me hungry just thinking about it. So! What is Moose Coffee all about? 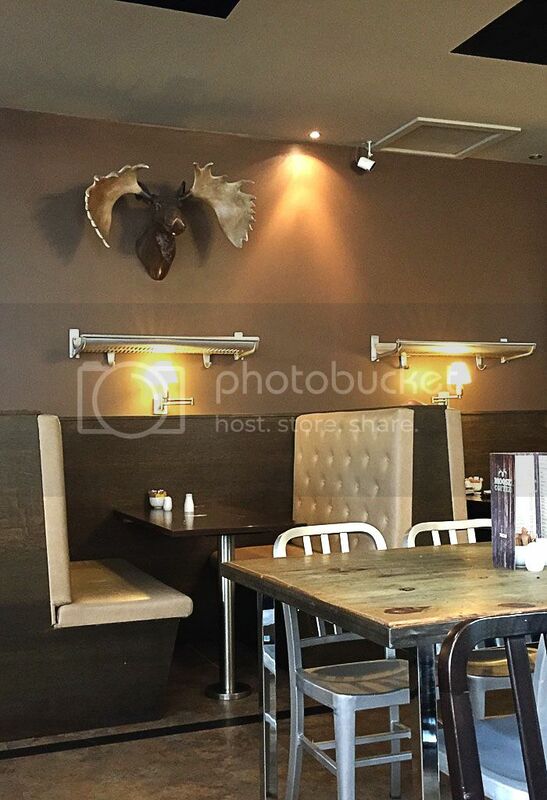 Moose Coffee is a small chain of American and Canadian influenced cafes that are well known for their amazing breakfasts. I think most of you will agree, breakfast food is the best kind there is. Well Moose Coffee certainly do agree which is why they have an all day breakfast menu, meaning you can have fluffy pancakes drowned in maple syrup for tea! Now if that doesn't sound good then I don't know what does. Upon entering the cafe, there is a warm atmosphere with friendly staff promptly greeting you. My photo doesn't do the décor justice, but it really is nothing like I have ever seen before, I just love every aspect of this place! Their extensive menu can leave you feeling overwhelmed, believe me when I say it is extremely difficult to decide. Do not even get me started on their Cookie Dough milkshake, all I can say is it is the one! From pancakes to eggs benedict to burritos, they have it all. On my most recent visit, I decided to sway from my usual order of pancakes and go for something a little different, the 'Bronx Brunch'. 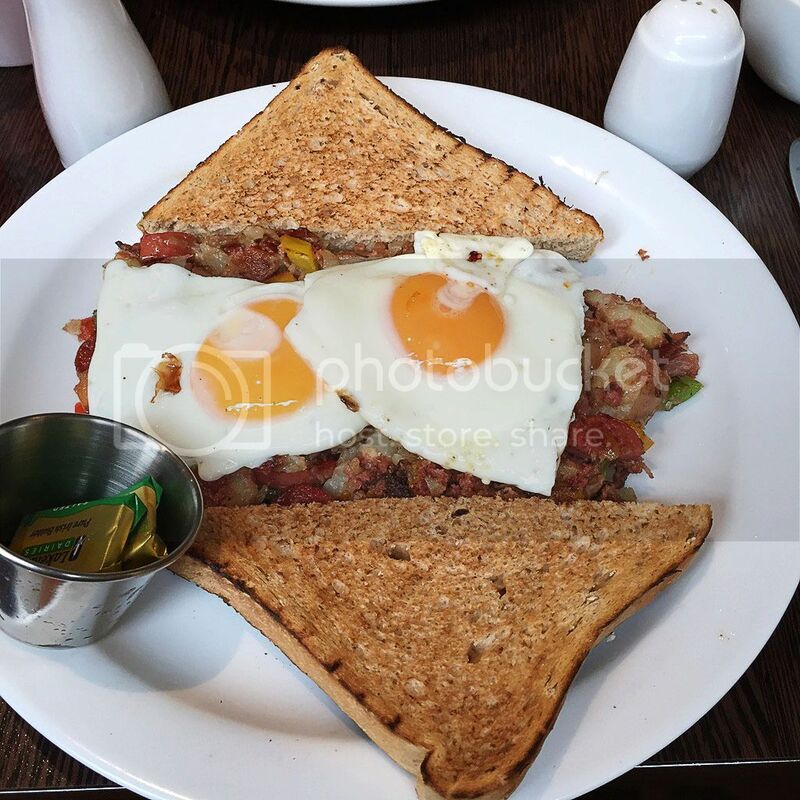 This consisted of their own potato hash recipe, mixed with cheese, sausage, bacon and topped with two eggs, accompanied by toast. I ate every last bite, it was so frickin' good! My mum on the other hand, opted for her usual sweet order of the 'Grande Bouche', I mean, look at the size of the bread, it certainly is grande! The portion sizes never cease to amaze me. 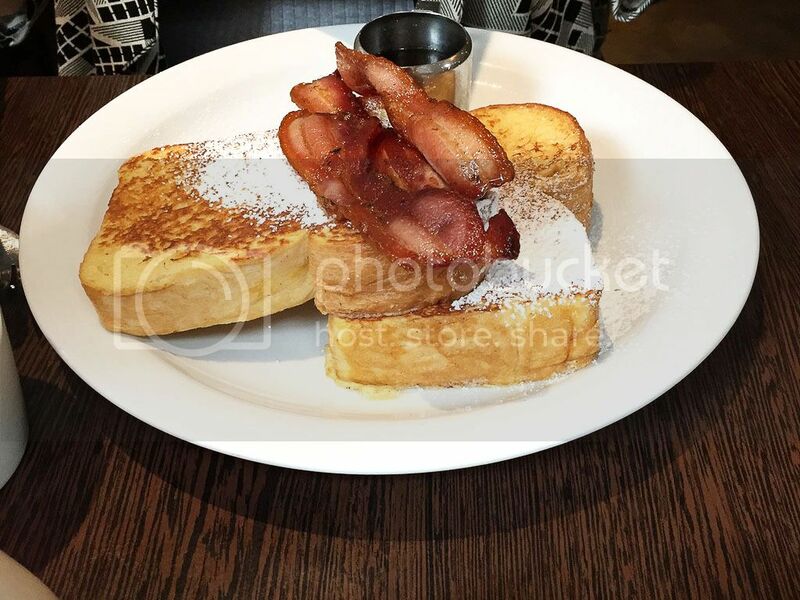 The 'Grande Bouche' is french toast served with streaky bacon and maple syrup, very yum indeed. The quality of the food and the portion sizes absolutely justify the prices at Moose Coffee as the menu is priced similar to any small chain business you would find in a city centre. Depending on the time you go, you could be faced with a waiting time due to how busy it gets, usually at lunchtime and the weekends, but that's really the only downside. This quirky little cafe gets a 10/10 from me and I'm sure I'll be back soon to get my pancake fix! Do you have any similar small chains where you live? Yummy! That looks absolutely delicious. I think I would go for your mums option, definitely. We have a cafe called the Scullery near me and it does the best scrambled egg! This looks like the perfect place for breakfast! This looks delicious! I've not been to Manchester in so long other than just passing through on the train, but I think I need to stop just to go here! Another place to add to my list to eat. You totally should, and invite me with you, haha! Mmmm the food looks too good!!!! I wish we had a place like this where I live. I often have some mornings free from uni and would love to go for a brunch there. Sadly, Manchester is way too far away. But it sounds and looks amazing!